An artist that loves chocolate, paper, giraffes, and drawing comics! Once upon a time, two programmers and two artists decided to make a game. 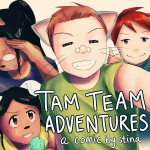 After 3+ years of work on a game that didn't *quite* meet expectations, one of the artists decided to exploit her team's silliness in comic form. Thus, Tam Team Adventures was born.